There is nothing like restoring a classic or vintage motorcycle to like-new condition, and even modern bikes can be revitalized and brought back to life for riding pleasure or show. Having a good, solid understanding of what's involved when it comes to restoring or painting a bike is half the battle, and the best way to gain that knowledge is through reading books and guides on the subject. Armed with that knowledge, you can start the journey of bringing a classic back to life, and be proud of the resulting product, whether you display it at bike shows, at your office or in your den. 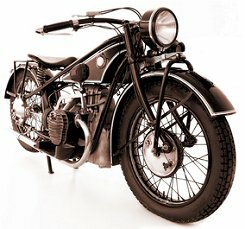 These are but a few things to take into account when considering a motorcycle as a candidate for a restoration project. Keep in mind that every situation is different, and what may work in one case, will not for another. Always ask others who have restored a motorcycle for advice and their thoughts on a particular question, especially if you think the suggestion would not apply to your project bike. As mentioned above, one of the most valuable assets is to have a good understanding of what's required to bring a restoration project to fruition. And the journey begins with knowledge, so make it a part of your plan to read as much as you can when it comes to the bike you want to restore, including related articles in magazines, websites and blogs. Get at least one good motorcycle restoration guide that covers the subject thoroughly. I have restored several motorcycles over the years, and one of the best ones was my 1975 Norton 850 Commando. I had painted and tinkered with other bikes before, but my Norton was my first, ground-up, restoration project. At the time I was living at my parents' house in South Florida, and we did not have a garage, so I had to improvise quite a bit in order to go through the whole process. I read as many books and magazine articles on the subject for both information and inspiration, and all of that gave me a solid foundation that allowed me to finish my bike after a few months of hard work. Anyway, here's a short list on some things to consider before starting your own project. Read anything and everything that provides information about what's involved in a restoration project. You may pick up some great ideas from a source other than a motorcycle resto guide. The Internet provides a wealth of information on any topic, including on how to restore a bike. A lot of that info is free, but be selective. There also is a lot of garbage out there, so use common sense. Talk to people who have completed restoration projects, even if they worked on different makes or models than yours. A lot of the info, tips and ideas will still be applicable and very valuable. Consider joining a club. Marque-specific clubs are great since the members are all focused on the make of one vehicle. Besides, clubs usually host annual shows and get-togethers which are great for inspiration and locating obscure, hard-to-find parts. You will need a place for your restoration. Ideally a secure, well-ventilated and well-lit garage. You may need to bring your workshop up to speed before you start your resto project, so get a book on the subject as well. (Hint: The Motor Bookstore sells a couple great books to help you set up your motorcycle workshop). Start compiling a list of individuals and/or companies that sell replacement parts, both OEM and aftermarket. Again, a marque club is a great source for good leads on that subject. Set up a budget. You have a computer, so start a simple spreadsheet to track expenses and stay within a budget. And even if money is not an issue, it is a good idea to have a clear picture of how much money you invested in your project bike. This may come in handy should you decide to sell it or even for insurance purposes. Take your time! A restoration project will be challenging. No question about it. But it does not have to become a nightmare. Avoid setting a "deadline." This is not a job, so don't make it one. If you thought your project bike was going to be completed in 4 months, and now it's been a year and 4 months, so be it. I hope your project is as much fun and exciting as when you started it. Don't allow an imaginary deadline ruin it for you. Again, these are nothing more than some basic tips and suggestions. Do lots of research and reading on your particular subject before, during and - yes - after. Who knows, by then you may be giving others some great tips about motorcycle restoration when they see the beautiful work you've done on yours.